The College Board, the nonprofit company that owns the SAT, announced a number of changes to the college admissions test Wednesday. In large part, the changes are an attempt to level an unfair playing field when it comes to test prep for high school students across the country. 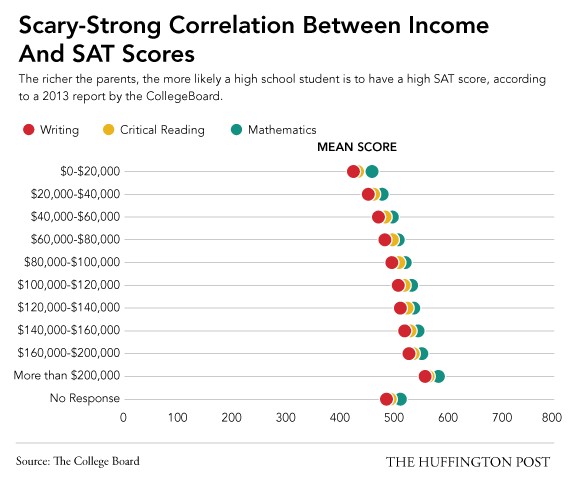 That stark correlation between family income level and SAT score underscores one of the major criticisms of the test: that as previously constructed, it gave wealthy parents the ability to pay for expensive test preparation courses in order to better prepare their children for the test, an advantage unavailable to many low-income youths. David Coleman, the College Board’s president, addressed the issue in prepared remarks Wednesday in Austin. "Too many feel that the prevalence of test prep and expensive coaching reinforces privilege rather than merit,” Coleman wrote. "It is time for the College Board to say in a clear voice that the culture and practice of costly test preparation … drives the perception of inequality and injustice in our country." The issue was also likely the motivation behind the company's decision to partner with the Khan Academy, a highly successful online study guide website, to provide students with free test preparation. The partnership was also announced Wednesday.